Taipei, Taiwan – BIOSTAR’s entire lineup of Intel 300 Series motherboards now supports the recently released 9th generation Intel Core processors featuring up to 8-cores, 16-threads Intel Core i9-9900K processors. This includes BIOSTAR Intel 300 series motherboards with chipsets: H310, B360, and Z370. To enable support for the 9th generation Intel Core processors, BIOSTAR Intel 300 Series motherboards users simply need to update the motherboard’s BIOS with the latest version. 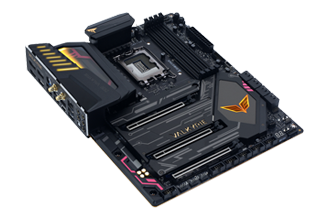 All BIOSTAR Intel 300 series motherboards can now take advantage of Intel’s latest Coffee Lake processors, this includes high performance gaming motherboards, entry-level models for home and office users, and the crypto-mining BTC series motherboards. This update will enable gamers and content creators to get the most out of their BIOSTAR Intel 300 Series motherboards by upgrading to 9th Generation Intel Core processors. The models include: RACING B360GT3S, RACING B360GT5S, B360MHD PRO, B360MHD PRO2, H310MHD PRO, H310MHD PRO2, H310MHC, H310MHC2, RACING Z370GT6, TB360-BTC PRO, and TB360-BTC Expert. The 9th generation Intel Core processors deliver up to 10% better performance on games such as Hitman 2 and World of Tanks over the previous generation Intel CPUs. It also delivers up to 34% performance improvement for video editing. All three of the 9th Gen Intel Core processors, i5-9600K, i7-9700K and i9-9900K, enable fast, immersive experience for gamers, with up to 8 cores and 16 threads, up to 5.0 GHz single-core turbo frequency, and 16 MB Intel Smart Cache. The 9th Gen Intel Core desktop processors deliver amazing performance, including unlocked “K” SKUs at each brand level and up to 40 platform PCI-e 3.0 lanes for system expandability for gaming, creating and overclocking. To update the BIOS of your BIOSTAR Intel 300 series motherboard to support the 9th generation Intel Core processor, go to the download page of your motherboard’s product page and download the corresponding BIOS version as listed below.